Cruising from Paris to Honfleur, discover the many historical and cultural facets of the legendary Seine River, from early Viking settlements to the beaches of D-Day and from impressive medieval cathedrals to Monet's Giverny. Save $250 per person* when you book by May 10, 2019! Special Air Rates & Services: As part of our special air program, FlexAir, available with this tour, you can choose from a wide variety of flight options. Visit the Tour Details tab and click on "Special Air Rates/Services" drop down. The River Seine, an important trade route from earliest times, led to the development of Paris as the center for French trade, politics, religion, and culture. Like travelers of old, cruise the legendary Seine and discover the significant historic, artistic, and cultural highlights of Ile-de-France and Normandy. Paris: Take a walking tour focused on the city’s history and architecture, and in the evening cruise through the City of Light aboard the Renoir. At the Musée de l’Orangerie, gaze upon the stunning Water Lilies paintings by Impressionist Claude Monet. View examples of high culture by visiting Versailles or the Opéra Garnier, then enjoy an afternoon at leisure. Giverny: Trace Monet’s passion for gardening to his artistic genius while touring his house and gardens. 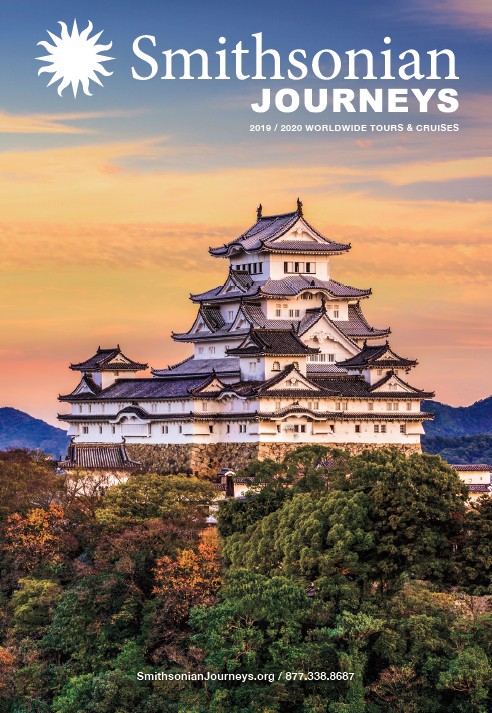 Châteaus, Abbeys, and Rouen: Explore historic sites along the Seine, including the fortress of Château Gaillard, the Château de Martainville, and the abbeys of Jumieges and Wandrille. Visit the Rouen cathedral during a walking tour of Normandy’s capital. 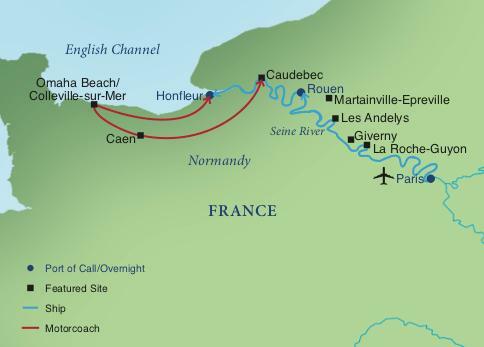 Caen and D-Day Beaches: Focus on modern history at the Memorial Peace Museum, Omaha Beach, Pointe du Hoc, and the American Military Cemetery. Honfleur: Enjoy a walking tour of the historic and charming Old Port, a favorite subject of the Impressionist painters who congregated here. Your Elegant Small-Ship Experience: Enjoy cruising aboard an upscale small river ship that features sophisticated staterooms and public spaces, superb amenities, excellent cuisine, and an informal ambiance. See more information about MS Renoir on the Tour Details page. Each voyage will also host other leading cultural and educational institutions, which will add to the excitement and energy of the experience. Depart the U.S. for Paris via overnight transatlantic flights. After a morning arrival at Charles de Gaulle International Airport, transfer to the Hilton Paris Opera where a hospitality room has been reserved. Enjoy refreshments and have time to explore Paris on your own. Your Smithsonian Journeys Travel Director will be available with suggestions regarding city sights, restaurants, and independent activities. A local expert joins the group for a discussion on The History of Paris. Afterward, depart the ship on a walking tour of the city's architectural highlights. Stroll the Left Bank and the famed Latin Quarter. Amble through the narrow streets where for centuries artists, writers, philosophers and the students of the Sorbonne have lived and worked. This morning is your choice between two included excursions ashore. Choice #1 – Palace of Versailles: Explore one of the finest French architectural achievements of the 17th century. Discover this magnificent palace with an expert guide who will take you through the Royal Apartments and the renowned Hall of Mirrors where the Treaty of Versailles was signed at the end of WWI. After visiting the Palace, there’s time to walk through the magnificent formal gardens created for Louis XIV by Andre Le Notre. Choice #2 –Garnier Opéra House: Step into the stillness of this exceptional space commissioned by Napoleon III and built between 1861 and 1875. See the grand foyer, marble staircases, and ceiling painted by Marc Chagall, then go behind the scenes to learn how this opera house inspired The Phantom of the Opera and Edgar Degas’ paintings of dancers of the Opera’s Corps de Ballet. This morning, depart the ship on an excursion to Claude Monet’s home and gardens at Giverny. See the gardens that inspired Monet’s renowned Water Lilies, viewed earlier in Paris. Monet’s passion for gardening led him to create flower gardens that are an expression of his artistic genius. This morning depart the ship by motor coach for an excursion to the ancient abbeys of Jumieges and Wandrille. Jumieges was originally built during the dawn of Christianity in the region and was made famous by the author Victor Hugo who described it as the “most beautiful ruin in all of France”. While exploring, you’ll see the Cloisters and the ruins of the Church of St. Peter. After the ship’s arrival at Honfleur, travel to Caen where you’ll explore the Memorial Peace Museum. The museum provides an important prelude to your visit to the Normandy Beaches and is the largest and most important museum dedicated to WWII. After lunch at the museum, continue to Omaha Beach, Pointe du Hoc and the American Military Cemetery at Colleville-sur-Mer. The cemetery covers 172 acres and contains the graves of 9,386 American soldiers, most of whom gave their lives during the landings and ensuing operations of World War II. Day 9 – Depart Honfleur for Paris and the U.S.